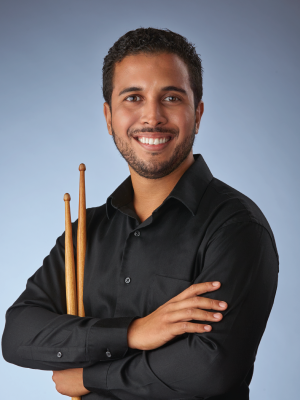 Pedro Fernández joined the percussion section of the Indianapolis Symphony in 2015. He spends his summers performing with the Chautauqua Symphony in upstate New York and has held positions with the Houston Ballet Orchestra and the Cincinnati Symphony. Pedro has also performed with the Detroit, Houston, Columbus, and Hawaii Symphonies, the Louisville Orchestra, and the Florida Grand Opera. Internationally, he has appeared with the Costa Rica National Symphony and as both soloist and percussionist/timpanist of the National Symphony of Panama. Pedro holds degrees from University of Miami and Sam Houston State University. He also attended the National Repertory Orchestra, and the Aspen, Pacific, and Texas Music Festivals. Pedro is an artist for Zildjian Cymbals, Evans drumheads, Majestic Percussion, Freer Percussion, and Grover Pro Percussion.